Nick Minck's three-point play with three seconds left in overtime gave Emerson the winning points in a 55-52 victory over Saddle River Day on Tuesday night. EMERSON – The play was supposed to include Nick Minck on the wing with the ball in his hands, but it was not designed to end that way. Tied in the waning seconds of overtime at home against Saddle River Day, Minck was supposed to be the facilitator, the one to make the entry pass into John Dime, Emerson’s leading scorer and the player that head coach John Ziemba preferred to take the last shot. What Minck had to do was put the ball on the floor from the wing, drive the baseline, take a tough runner from in close and sweat out the whistle that was blown while he was in the air. It was the classic block/charge decision that the referee was forced into, it went Minck’s way and he also made the accompanying free throw with :03 left on the clock for the winning points in a 55-52 victory. 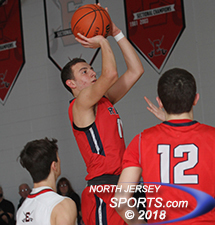 Saddle River Day's Nick Eiler hit a three-pointer with 8 seconds left in the fourth quarter to force overtime. That shot and the free throw finally put an end to an entertaining game in which neither team had more than nine point lead. Saddle River Day led 15-12 after the first quarter before Emerson Pete Durocher scored the final five points of the second quarter to put his team in front, 19-17, at the break. 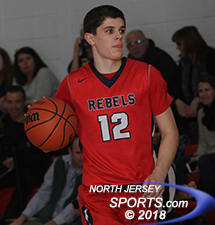 Dime, Emerson’s leading scorer and one of the best post players in the NJIC, was the focus of the Rebels’ defense all night long. If they were not in a sagging zone designed to clog the middle, the Rebels played a man defense with a second defender always made available to make it tough for Dime to get touches in the post or find room to maneuver when he did. Dime was limited to just two points in the first half and did not score for the first 5:56 of the third quarter, but he broke out soon after and Emerson almost pulled away for good. 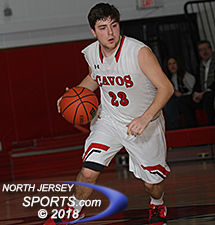 Dime got going at the free throw line and made four of them in the midst of a 10-3 Emerson run that gave the Cavos the largest lead for either team in the game, 33-24, before Saddle River Day’s Kevin Ranaghan hit a step-in jumper to get his team back to within seven points heading into the fourth quarter. The Rebels tightened it up further by scoring the first four points of the fourth quarter, the first three coming on Ryan Toronto’s conventional three-point play, to get within three points and it was nip-and-tuck for the rest of regulation. Kyle Covello scored 9 points for Emerson, which improved to 8-2 on the season. The Rebels nearly did just that as they hung around long enough that a couple of key plays late in regulation gave them the opportunity to extend the game into overtime. A held ball off a missed shot awarded SRD another possession with 46 seconds left in the fourth quarter and it missed a potential game-tying three-pointer, but instead of having to scramble around trying to foul, Toronto picked off the outlet pass and gave the Rebels a third try at a tie. This time Nick Eiler cashed in the opportunity with a trey that knotted the score at 45 with eight seconds to play and the Rebels almost won in stunning fashion when Garrett Kuhlman got a steal and launched from halfcourt only to see the ball bounce off the backboard and front rim before falling to the floor at the buzzer. Dime, who scored 14 of his team-high 16 points after halftime and 10 of those in the fourth quarter and overtime, opened the extra session with a basket in transition to put Emerson up for good. Durocher scored on a drive and David Johanson made a free throw to make it 50-45 with 2:26 to go, but still the Rebels did not pack it in. Two inbounds plays from under the basket that did not go off as planned turned into two Connor Cyran clean-up buckets, the second of which came with 49 second to go and had SRD to within 51-50. Durocher then made one of one of two free throws which was answered by a two free throws by SRD’s Seb Giannotti with 22 seconds to go that tied the score at 52. Kevin Ranaghan scored a game-high 18 points for Saddle River Day which fell to 5-7 on the season. Then, with Dime in the post and with the ball on the wing, Minck made his move and it turned into the game-winner made official when the Rebels last-ditch effort, a heave from the halfcourt, was off the mark. Emerson is now 8-2 on the season heading into a Thursday matchup against Cresskill, which has separated itself from the rest of the NJIC so far. 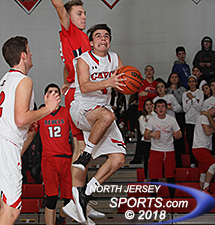 Regardless of what that result might be, the Cavos have put themselves in a position for an automatic bid to the Bergen County Jamboree. Dime was joined in double figures by Durocher (13 points) and Kyle Covello and Johanson each finished with 9. Minck scored half of his 8 points in overtime as Emerson got all of its scoring from its starting five. Ranaghan (18 points) and Cyran (13 points) finished in double figures for Saddle River Day. Giannotti added 8 off the bench, Toronto and Eiler each added 5, seemingly all of them in big spots and Kuhlman’s three-pointer rounded out the scoring for the Rebels, who fell to 5-7 on the season.